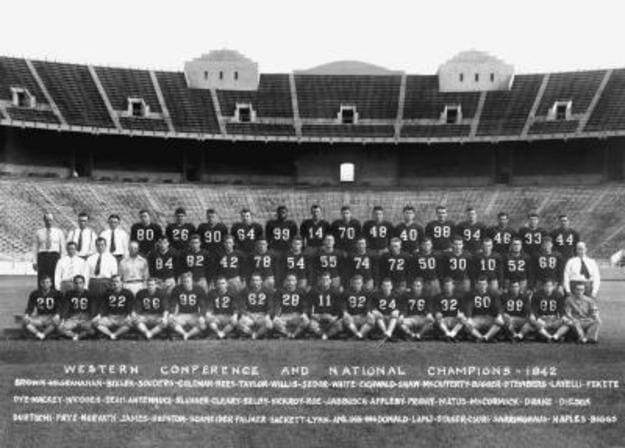 '42 was the first consensus national championship for the storied OSU program, and behind a dominating line featuring All-Americans Charles Csuri and Lindell Houston, the Buckeyes were truly dominating, winning their games by an average score of 37-11, and dropping their only game when half the team fell ill after drinking contaminated water. The '42 squad was noteworthy and badass for another reason as well: undersized (at 202 lb.) lineman Bill Willis, the first African-American on a national championship team, who had been recruited off the Buckeye track team the year before by pioneering coach Paul Brown.